Newly remodeled kitchen (excuse the mess!). This job was designed by John Shermer, Architect (301-788-5152). 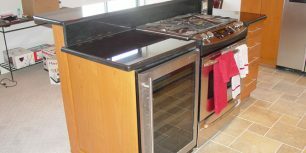 It included a first level kitchen expansion of 8′ × 20′. We removed the existing exterior walls and installed new support beams, allowing for the addition. The first floor kitchen was moved out into the new addition. 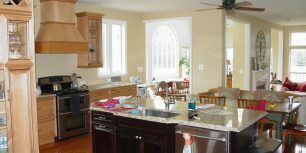 The existing kitchen area was expanded with additional cabinets and an island featuring a sink. We redesigned the wall between the dining room to become a low wall serving as a counter, wine cooler, and new pantry cabinets. We also created a new desk area for the children to do homework. 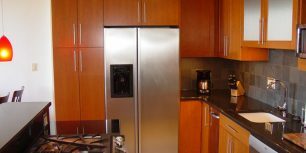 We complimented the kitchen with recessed lights, new hardwood flooring, and granite counters throughout. In addition, we enlarged the openings to the sun room to complete the open feeling of the new kitchen and dining area. 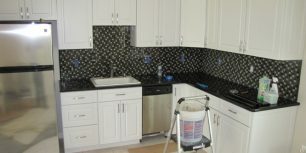 Kitchen remodeling project in Arlington, Virginia. This job was designed by DGI Design Group/ Diane Gordy (301-229-9500). 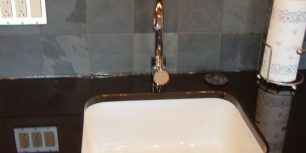 The job consisted of a complete renovation to the existing 3 bedroom condo in Arlington, Virginia. 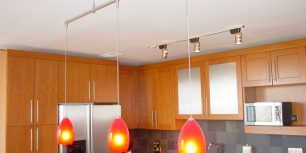 The new kitchen was renovated to include new low voltage track lighting and a more contemporary feel. New carpet and tile flooring was also installed.